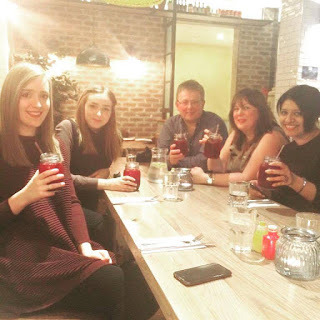 Intu Derby Healthy Eating Blogger Evening - 26th January 2016. Last week, I was very kindly asked if I'd like to attend an event for Derby based bloggers at the intu Centre . Before this, I'd never been to an event like it. I was super nervous as I'd never met any other bloggers before, I'd only spoken to a couple via Twitter. Seeing as it was on a Tuesday evening and it worked perfectly around my working hours, I decided I'd take the plunge and go for it. I'm a very nervous/ shy person when I'm around new people. We'd all been sent an invitation with instructions to meet at Eat Central (their food court) at 6:45pm. It was a little awkward as I didn't know what anyone looked like! The first person I came across was Olivia from Living-OnAShoestring. We had a wander to look for others and shortly spotted Angie & Paul from The Sticky Beak Blog, then Ria Amber Tesia. We were all welcomed by Tania who was hosting the evening. 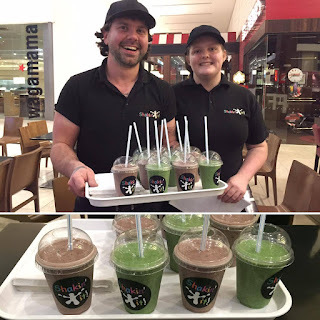 Our first stop was with the guys from Shakin' It (view my previous review). They're best known for their thick, creamy, chocolate filled milkshakes but they do so much more than those. We were treated to two flavours of their 'Fruit Fusion' shakes. My favourite was the green one but they were both excellent. The contained things like Whey Protein Nutri-pellets, chia seeds, hemp seeds and all sorts of vitamins and healthy ingredients. They're a great way to get some extra goodness into you, especially if you're on the go! Next, we headed over to Yo! 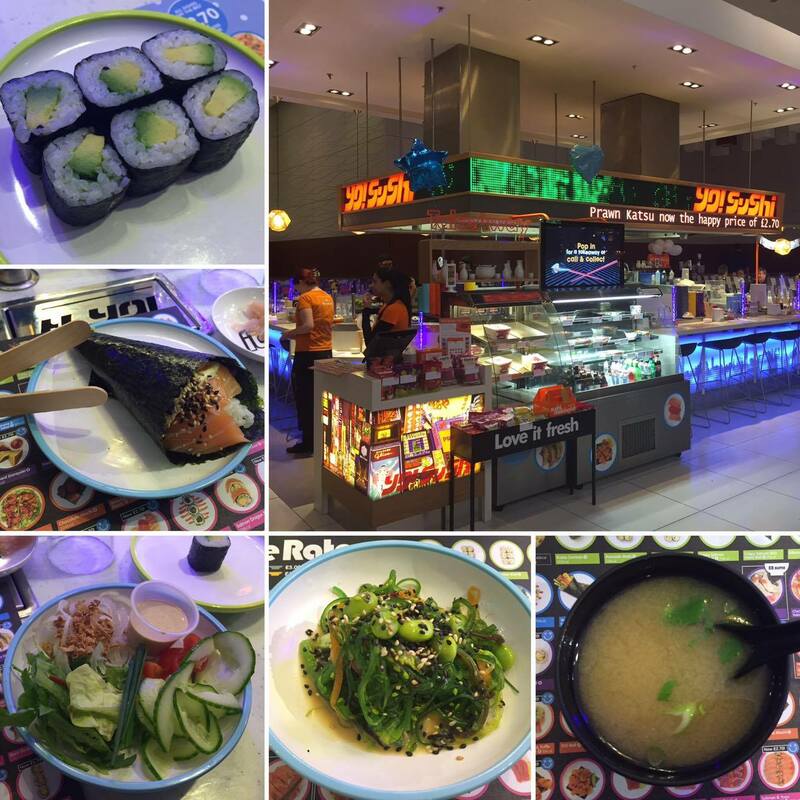 Sushi which is relatively new to the centre. I've never had sushi before so was raring to give it a go! I'm not keen on fish, so was looking forward to try the non-fishy dishys to show that it can be enjoyed by all. 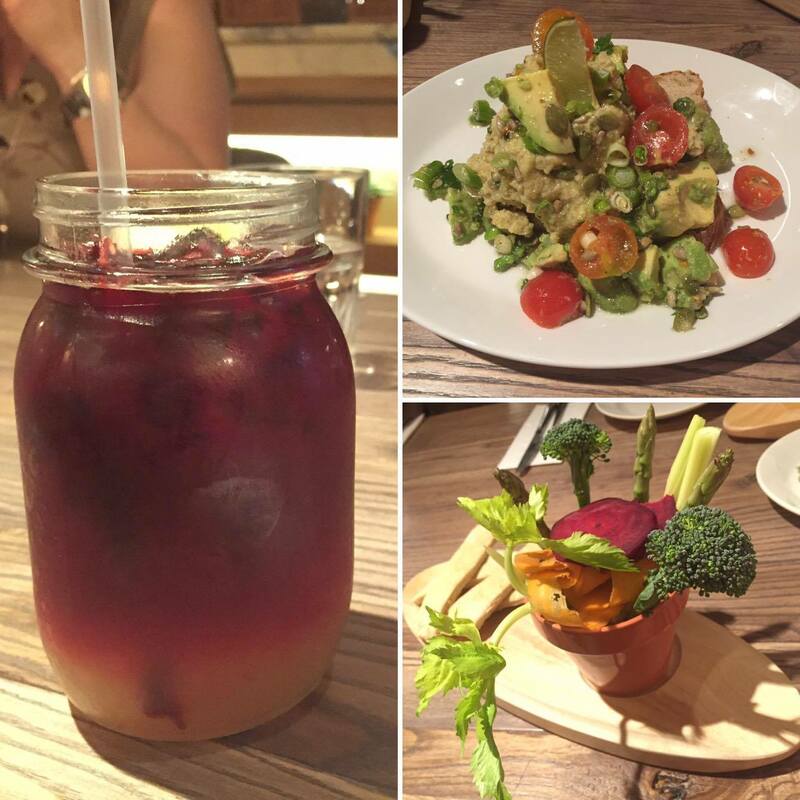 We were able to try so many of their dishes, it was overwhelming! In the top left is Avocado Maki - Very tasty. It had quite a thick gloopy texture but it worked. Middle left, Salmon & Avocado Handroll - I did eat this, but just left the salmon. Was very similar to the Maki. The next two were salads, Goma and Kaiso then a broth (which apparently is very good at curing hangovers). The staff were all very helpful and happy to explain what was in a dish as I didn't have a clue! Afterwards, we took a trip to Joe's Kitchen. Another one of the new intu restaurants. We were greeted by Ryan who went through what we'd be sampling. He went away and returned with these freshly made jars of juice. They contained beetroot and apple. Beetroot juice was new to me but it actually tasted really good. The two flavours went together great and like with the Shakin' It Fruit Fusions, a drink is a great way to get the extra vitamins and goodies into your body. In the top right was the Avocado open sandwich (avocado was a popular ingredient throughout) which looks a bit of a mess but tasted amazing. The sour dough bread is topped with their homemade houmous, cherry tomatoes and a squueze of lime for an added zing. Bottom right was a Vegetable Patch. A plant pot filled with the same home made houmous with lots of different veggies stuck in. There was also some pitta on the side which was nice to dip in. I loved the broccoli and thought this dish was super tasty. I wouldn't normally go for something like this but will definitely order it next time I visit. Might even pop by just to have it as a healthy snack! After consuming all of this, we rolled next door to Byron. When I heard this was where we were going, I was a little confused. From what I'd heard of Byron, it was just burgers. Oh, how I was wrong. Here in the top left, we have a beetroot and feta cheese salad which was great. Very light and refreshing. The Quinoa, Avocado and Roasted Tomato salad which again was really light but I must say I personally preferred the other. Top right was a Skinny Burger. It's everything you'd have on a burger just without the bun! By leaving out the carbohydrates, you're left with a meal which is a lot healthier for you. A great option if you're out for a meal but are watching your waistline. 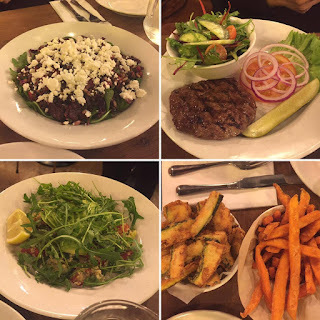 Finally we had sides of the Courgette Fries & Sweet Potato Fries. Sweet potato fries are really popular at the moment. They taste so good and are a lot better for you as they contain fewer calories, fat etc. The Courgette Fries were amazing. I was really surprised I like them as I'm not a fan of Courgette usually. The light buttermilk batter does add extra calories but still a lot healthier than standard fries. Our last stop of the evening was Wagamama. Funnily enough, another restaurant I've never been to. We were taken to our table and given a cup of Green Tea each. Green Tea is a great fat burner, lowers risk of illness and has many other health benefits. I have to be in the mood for it myself, but catch me on a good day and I'll drink the whole thing. This was followed by a 'Positive' juice (bottom right) which contains cucumber, spinach, pineapple, apple and lime. The lime comes through really strong. I loved this juice. I drank it like water and it was soon gone. 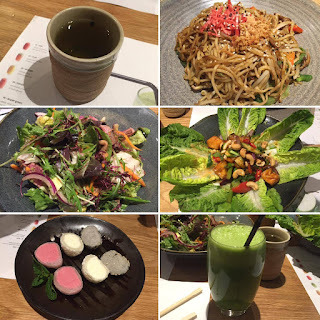 We also had Shitake and Sirloin salad, Chilli Tofu Salad and Yaki Soba/ Yasai Yaki Soba. My first experience of Tofu was a little strange. It was ok. The squishyness was a little confusing but I'd happily try again. Our dessert was another from Wagamama - Mochi Ice Cream. We were given three flavours. Raspberry, Coconut and Sesame. The ice cream comes in a sticky rice shell, the sesame then sprinkled with seeds. My favourite was the raspberry. It was a really good palette cleanser to end out evening. The coconut was just like eating a Bounty. I wasn't that fond of the sesame but others around the table said it was there favourite. All personal preference. I'm very grateful to the team at intu Derby for inviting me along for this experience. I had an amazing time sampling all of the tasty food that their Eat Central has to offer. It's great to know that if you are watching what you eat, there are still plenty of options to chose from in the centre. I also loved being able to meet some fellow Derby bloggers. They were all so lovely and it felt as though we'd all been friends for years. Let me know what your favourite is!